Some snakes regularly consume prey weighing up to a quarter of their body weight. After ingesting such a mammoth meal, snakes need time to rest peacefully and begin digesting their prey. If jostled or frightened, a snake may vomit up a meal. While you can certainly move a recently fed pet snake in the event of an emergency, you should avoid handling your snake under normal circumstances for at least one day after feeding him. In addition to variety of illnesses, recently fed snakes may vomit for several other reasons: fear, stress, handling and overeating among them. When snakes eat, they become much less agile and considerably slower; this can put them at risk of predation. 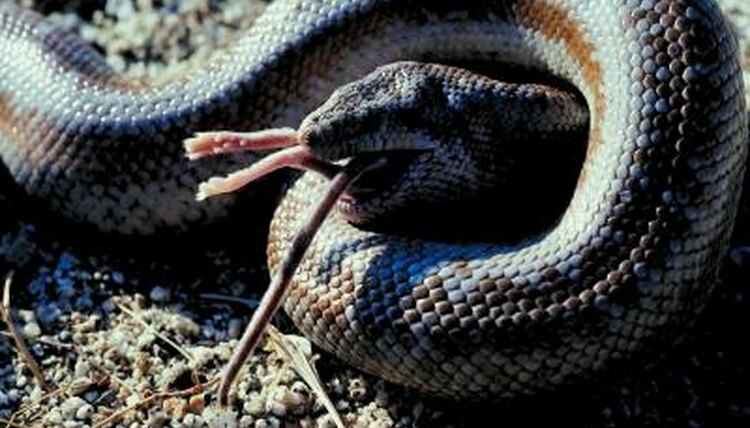 Accordingly, when a snake who has just eaten observes a predator, he may vomit so he can move more quickly and escape. Further, sometimes the movement and jostling associated with captive handling cause enough stress to make a snake vomit after a meal. Sometimes, meanwhile, a snake eats a meal he's unable to digest in a reasonable time. Bacteria can build up in a snake's belly in such an instance, releasing toxic chemicals and vomit. Many things can affect the rate at which your snake digests prey. In the best of circumstances, a snake with access to suitably warm temperatures may digest a small mouse in two or three days. Conversely, a large python who consumes a deer may spend weeks digesting. As a rule of thumb, wait 24 to 72 hours after your snake has fed before holding him. However, if your snake still exhibits a large food bulge after three days -- or if it has gotten bigger since the initial ingestion -- refrain from handling him. Give him 48 more hours and re-evaluate his status. If you mistakenly handle your snake too soon after he has eaten, he may vomit while in your hands or shortly after returning him to his cage. Vomiting such a large item is hard on his body; he'll need to rest, relax and recuperate. Ensure that he has access to clean water -- vomiting usually causes dehydration. It may be beneficial to soak your pet for about an hour the next day to ensure that he rehydrates completely. Use a clean, secure plastic container to soak your snake, and provide only about 1 inch of water so he can rest comfortably with his head above water. Do not make your snake swim continuously. Give your snake seven to 10 days before offering food again, and use a smaller food item than the previous meal. If unforeseeable circumstances necessitate moving your snake immediately after a meal, do so with great care. Realize that some snakes are aggressive immediately following a meal, likely to strike just about anything that enters their cage. After letting your snake calm down for several hours, slowly move him as necessary. Support his head and body as you normally would, but try not to touch his stomach bulge if you can help it.